Several weeks ago, I shared the Melted Crayon Canvas I made with my youngest daughter. It was so much fun and turned out so cute, that I decided to do it with my oldest daughter and several of her friends at her Book / Craft Club. The girls (all nine of them!) had a lot of fun choosing their colors and designs and were thrilled with the finished canvases. I made just a few little changes from our original project so it was more manageable for a group. I only took a few pictures of the process this time (because I had nine giggly girls to manage ;) ), so you can check out my original post if you want more details. To prepare, I bought 4-5 boxes of 64 Crayola crayons and separated them in bowls by color ~ reds, oranges, yellows, etc. I also had pieces of contact paper cut in squares for the shapes and stencils that they could use to make their initial, a heart or a star. Because I didn't want all of the girls wielding their own glue guns to attach the crayons to the canvas, I had them use glue dots instead. The dots held just fine and held the crayons in place right away (without having to wait for regular liquid glue to dry). I'd still recommend a hot glue gun if you're making just one by yourself, but for kids, the glue dots are the way to go. I also gave each girl the option to put a shape or initial on their canvas, or just use the crayons. All of them chose to put something on their canvas They cut out their own shapes after tracing onto the contact paper and then put them on the canvas. Such a great craft to do with a bunch of kids! So Fun- look at those girls smiles..they Loved it! You are such a fun mom! 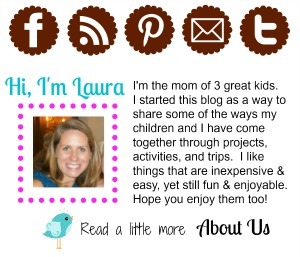 Laura, you did it once again- I have to say it once again... Supermom! Too fun!! You are a fun (and brave) mom! I have to be in an exceptional place before I'll even take on finger painting with my 3! 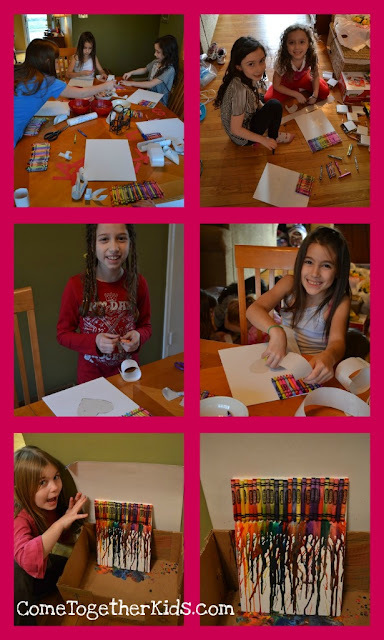 What a fun activity for the girls! Thanks! It was definitely loud and crazy here while the projects were going on. It took a little longer than I thought, so we couldn't use the dining room table for our dinner and I had nine girls eating pasta on the living room floor as I was helping with the melting!! Oh, and I did treat myself to a glass of wine after everyone left. But it was worth it. 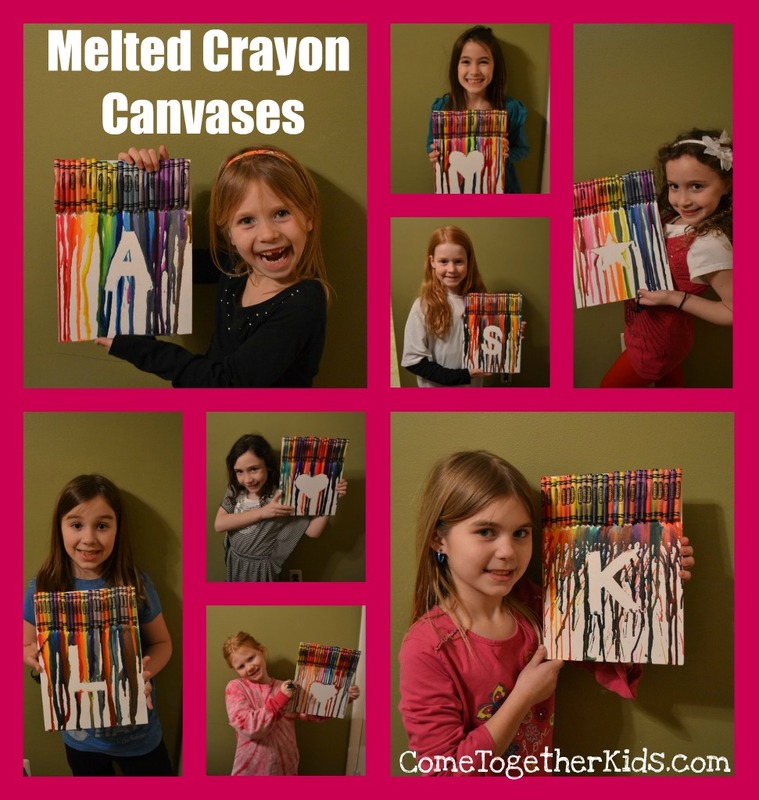 I love the idea of putting a letter under the melted crayons. So gonna do that for my daughter's room! That's awesome! So I'm assuming the stencils just lifted off fine even though you put the glue edge around it?? I never would have thought about that! And I need more details on this book/craft club! My daughter's been asking me to do something like this, but most of the moms thought it would be too much during the school year. Wondering what yours involves? I'll be sharing this at my spotlight party tonight! Natalie, yes, the stencils lifted off fine. As soon as the wax was cool enough to touch and not drippy any more (just a minute or so), I just got my fingernail under the edge of the stencil and lifted it up. I'll email you the details of the book club. It's fun. What great ideas! Thanks for posting them for everyone else to share with their kids/family! Awesome ideas! Just came across this. I'm going to order a custom box of crayons from crayola. Various pinks for my daughter's ballet room, and her "cut out shape" will be ballerina slippers. The boys have a transformer room and will get gold, silver, red and blue in their custom box of crayons, and an autobots symbol. SO cool! What a great idea, thanks for this!!! Here's my first post on this process which goes into more detail about the actual steps. Let me know if you still have any questions. I think this project was very fun! but i do have one problem... i peeled the wrapper off the crayons and the colors mixed as they melted and mine did nt end up working:( it still looks cool but it didnt work quite as well! thanx for the great idea i love it and never would have thought of that myself! 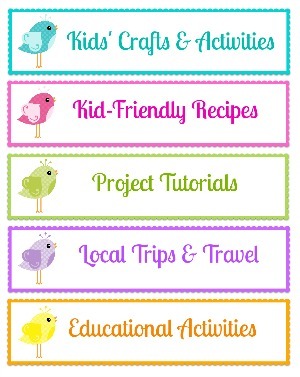 I'm looking for a project for my daughter's bday party and I think I just found it! :-) One question, though. I'm living in Germany and the glue dot concept is new to me. I found I can order them on Amazon but I'm not sure which size. Mini, 3/8", 1/2" looks like what I can get here. Also, is there a brand that sticks better and ones that don't? Thanks! I'd say the mini ones would probably be the best bet. I don't have a particular brand I recommend, any one that says permanent hold. They come on a paper strip and you just tap the crayon (or other object) onto the strip to lift up a glue dot and then adhere it to whatever you like. I will add, though, that although the glue dots worked well (and were definitely better than giving the girls all hot glue guns), if they didn't get the glue dots on right on a few crayons, the crayons ended up being a little loose. If I were you, I might have a hot glue gun on hand to "touch up" any loose crayons with some stronger hot glue before the girls leave. What could you use instead of contact paper? I want to make this tonight and don't have contact paper on hand! Thanks! I'd imagine most kinds of tape could work ~ perhaps the patterned duck tape, masking tape, etc. Just test it out first to make sure it sticks pretty well, but you can still pull it back off the canvas. Hope this helps. Good luck!! Great suggestion, I'll likely use masking tape and go around the edges with the glue gun :) Thanks! If you don't have contact paper what could you use in its place? I'd imagine other kinds of tape could work too ~ perhaps clear packing tape, masking tape, or even the patterned duck tape. Just test it out to make sure it'll stick to the canvas but will still be able to be pulled off when you're done. Looks great! I'm kind of confused on how you got the contact tape to secure. Did you put hot glue around the edges of the contact paper without touching the canvas? Because if it were on the canvas would it not be hard to pull off afterwards? It's a little tough to explain, sorry. I ran the hot glue right over the edge of the contact paper where it touches the canvas ~ so the line of glue was half on the contact paper, half on the canvas. This way, it "sealed" the edge, but because only half of the line of glue was on the canvas, it peeled up fine. Does that make sense? Thank you for clarifying; this is the answer I was looking for. Can't wait to try this with my nine-year-old daughter tomorrow! Thanks again! Hello Laura, i really loved your idea, it looks very nice to decor a girl's room.... I just want to know, how I do to make the crayons get melted? we've spent infinite hours to investigate and observe top rated cribs and ultimately selected quality of the fantastic infant cribs primarily based on most patron evaluations. right here is the listing of first-class child cribs given underneath. i accept as true with you'll in truth enjoy! توجد انواع كثيره للعزل منها المائى والحرارى ولكن افضلهم هو عزل فوم لان هذه الماده تمنع تسريب المياه او دخول الحراره واشعه الشمس الى المكان وتجعل المكان امن جدا فى الاستخدام من حيث وجود عد تسريب من اى نوع للحراره او الماء فيمتاز عزل الفوم بتنوع استخدامه على اسطح مبلطه شركة عزل فوم بالرياض تقوم بتقديم خدمات عزل فوم على اعلى جودة بكل انواعة لاننا نمتلك المواد الفعاله والقويه جدا والاصليه التى تجعل من العزل ممتد لسنين ومعة ضمان واسع المدى لضان القيام بكافة الاعمال ولن يتاثر العزل سلبا ولضمان المعايير العالميه فى المنازل الجديده فينصح باستخدام عزل فوم لانه الامن على صحتك وصحة اسرتك وسلامه البناء من اى تسريبات اخرى . هو استخدام ماده تسمى البولى يورثين والمعروفة فى جميع انحاء البلاد على انها تسمى بالفوم وهى عباره عن ماده خفيفه جدا مستطيله او على حسب الحجم المرغوب ويكون لونها ابيض ولها استخدامات عديد فهى تحمى الاجهزه الكهربائيه من التكسير او الخدوش وتحمى المنقولات ايضا والانتيك ولكن فى حاله العزل تكون هى طبقه توضع بشكل دقيق لكى تحمى المكان من اى تسريب حرارى او مائى عزل فوم بالرياض هو عزل امن على الحمامات والمطابخ والاسطح والخزانات لتحميها من اى تسريب مائى والاضرار بالمكان واصحاب المكان من اى مخاطر قد تحدث من التسريب ومن الاشكال التى تستخدم عزل فوم بالرياض ( عزل الاسطح , عزل حمامات السباحة , عزل الخزانات , عزل المناور والاماكن القريبه من شبكات الصرف الصحى , عزل الخرسانه المسلحة ) . i have a link this link is very importent for your information. nice website i have a link this link is very importent for your information. Nice, This can be one particular of the most helpful blog. keep it up more, Thanks for sharing.. Perfect article and infor you are sharing with us, Thank you. You can easily install Windows using a different key and then change the key later to activate the windows 10 product key. Similarly, you can change your Windows key anytime you want. Discover realistically where you are at today ... and what Preventative actions are needed. Use our step-by-step Self Assessment Tools to discover what actions you need to take to Protect your IT System and your vital Data. A hacker breached into a school network of San Diego Unified School District and stole the data of almost 500,000 staff and students, which has caused the breach of data protection act, because of the cyber attack the hacker gained the credentials of authorised staff member via phishing revealed by the district by posting a breach notice on its website. My Assignment Services is one such Australian Assignment Help provider which provides a helping hand to all your academic related queries. They have a lot of professional experts who are skilful in giving you guidance and providing you with cheap assignment help services. You are free to contact their experts by visiting their website and get your pending presentations completed on the time. Given below are some of the steps that they follow while drafting your assignments. Many students see that Geography Assignment Help experts are proficient in writing your assignments but no one wonders the reason behind it. However, students pursuing IT need to understand the concepts of Java because it holds down the concept of object oriented programming. The programming concepts are complex to understand and brings a havoc to students, that is why, My Assignment Services bring you our online assignment help services. Taking out some time to consider and contrast about what options that you have that you can include by writing them on a piece of paper. You can also contact some real time Geology Assignment Help experts to assist you with the following topics.